The Fiesta Premier is a first class All Inclusive Resort and Spa in the North Pacific coast of Costa Rica, and it is an ideal place to restore your peace of mind, health and spirit, as well as, a place to live unforgettable moments of joy and sporting activities. The resort consists of 160 rooms in which you would relax and rest while the ocean rocks you. 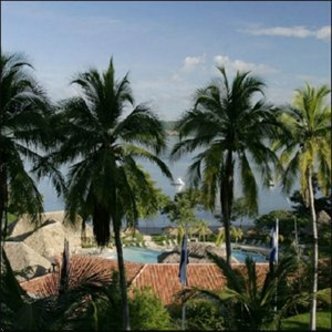 The Fiesta Premier Resort is located in a private bay in the Gulf of Papagayo, in the Pacific North Coast of Costa Rica. Fiesta Premier is just 20 minutes away from the International Airport Danial Oduber in Liberia with access to the main tourist attractions in the area and an ideal spot for world class fishing -Merlin, sail fish and other challenging species- and 18 hole PGA golf courses nearby.Reservations require full stay credit card deposit at the time of booking and your credit card will be charged by International Vacations. We require a phone/fax or email address at time of booking to receive your voucher from International Vacations.This hotel is managed by International Vacation. Any inquiries should be directed to their customer service department at 1-888-431-2866. ***PROPERTY NOTES***Cancel Policy -For bookings up to 14 days in advance of arrival - cancel 15 days prior to arrival date to avoid penalty of 100 percent of stay.For bookings made 15 to 30 days in advance of arrival - cancel 31 days prior to arrival date to avoid penalty of 50 percent of stay.For bookings more than 30 days in advance of arrival - cancellation will result in a penalty of 2 nights room change.Deposit Policy - For bookings up to 14 days in advance of arrival - a deposit of 100 percent of stay is required at booking.For bookings made 15 to 30 days in advance of arrival - a deposit of 100 percent of stay is required at booking.For bookings more than 30 days in advance of arrival - a deposit of 100 percent of stay is requried at booking.Guarantee Policy -For bookings up to 14 days in advance of arrival - guarantee to valid form of payment is required at booking.For bookings made 15 to 30 days in advance of arrival - guarantee to valid form of payment is required at booking.For bookings more than 30 days in advance of arrival - guarantee to valid form of payment is required at booking.